Content on your blog is your work and time spent building your blog, and it is all stored on a remote webserver.If your site is hosted on a shared hosting server, then there are many blogs hosted alongside blog on the same server, and any problem arising could affect all the sites risking your data aswell.Though Hosting server have backup but are not backed up on a daily basis, If its daily that very good as the data can be recovered with a minimum loss, but its always better if possible to backup your data on a different server so that recovery and control is in your hands. If you have a self hosted WordPress Blog then this plugin from iDrive can very useful.IDrive is a online backup service provider that lets you take a automatic backup of WordPress blog data into your IDrive online backup account using IDrive Plugin For WordPress.The free account gives 2GB of free online storage space to backup data.The plugin uses the WordPress cron to schedule backups, and auto backups data everyday after 12 midnight.Data backup is incremental that means after the first complete back the subsequent backups, only the new and updated data is only backup which will make backups faster. Through the Plug-in Settings Page, create a new IDrive online backup account. IDrive Plug-in for WordPress backs up all files under WordPress installation directory, including all themes, pictures, Plug-in’s etc. All these files are backed up into /Wordpress_backup/ directory inside your IDrive account. Apart from the WordPress files, MySQLdump of entire WordPress database is also backed up. The dump file, IDW_WP_MySQL_dump.sql is backed up into /Wordpress_backup/ directory. In the iDrive WP Plugin Admin, Press the ‘Restore Now’ button to restore the data from the backup and the data is restored will be placed under “wordpress_restore” directory under the IDrive plug in installation folder. Individual files can also be restored using the web interface of IDrive. Note : Each wordpress blog should have its own IDrive account. 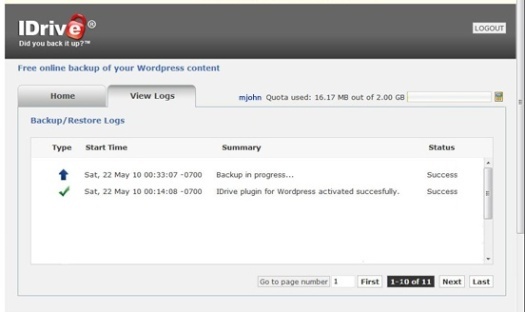 Using multiple wordpress blogs for the same IDrive account will overwrite backup data of each other. Users can also access the data from their desktops using the iDrive Classic Software or use the Web Interface to browse the backups and download from backup onto any system.